We all know that it is a nice choice to backup DVD to hard drive for enjoyment or collection. The wonderful DVDs are not some cheap stuff and they may cost you much money. While if you backup DVD to hd, you can get much convenience to save money and enjoy your favorite DVD videos on PC. As for the DVD backup software, WonderFox DVD Ripper is really a great choice for you. It can meet your demands to backup DVD well. Just as I mentioned above, we can save much money and get more convenience to enjoy DVD videos if we backup DVD to hdd. These two factors can be defined as the major reasons for common users to backup DVD. Besides, it also gets some more benefits. Have you ever tried to achieve homemade DVD disk? If you did, you do need check more about how to backup DVD to hard drive. We all know that users can not edit the DVD video content directly with a CD-drive. If you try to make your own style video with the DVD video content, you do need rip DVD to hard drive at first. Rip DVD to hard drive and back-up, that is the indispensible step to make your video editing process much easier. In the meantime, it is also pretty effective and important to backup DVD to hd for its safety and maintenance. With all the benefits, you need a related DVD software to backup DVD to your hard drive. You may find lots of backup software over the search engine, but you will still feel confused about which one is good. The great solution that I recommended is WonderFox DVD Ripper that helps you backup DVD to hd. With the listed features, it can meet all your demands for video quality, speed and more powerful functions. 1. Quality output video effect. It can ensure the nice original DVD video effect with pro decryption. You don't need worry about the impact of scratch and damage to DVDs. 2. Fast speed and safe conversion process, which can make you backup DVD to hard drive fast without any viruses or spywares. 3. Easy-to-use handling process. This factor can save you much time to handle the DVD backup software easily. 4. Various output formats for PC and video devices. This feature can make you get more choices as for the desirable situations. 5. Extra functions. The trimming, cropping and special effect can make you enjoy the pleasure of video editing randomly. After this, we need know how to backup DVD to hard drive with this great DVD software. It is pretty easy-to-use to backup DVD with WonderFox DVD Ripper. You can know the handling process well without any prior learning process. 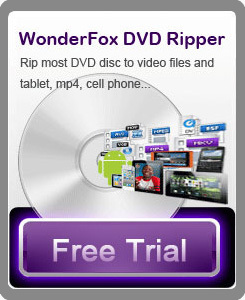 Download the WonderFox DVD Ripper and install it. Step1: Run the software and load DVD disk first. Step2: Choose your desirable format as the output video format. Step4: Click "Start" to launch the whole converting process. Step5: Click to get the output videos after the converting process. With few clicks, you can backup DVD to hard drive easily and fast. WonderFox DVD Ripper is really a great software to backup DVD. In conclusion, the WonderFox DVD Ripper is really a good choice for us to rip/convert DVD to video. The DVD ripper runs well on Windows, so, we can easily convert DVD to PC, convert DVD to Hadr Drive, copy DVD to tablet, convert DVD to cell phone with it. Furthermore, the software also allow us to convert DVD to AVI, convert DVD MKV, convert DVD to WMV, convert DVD movies to MP4, rip DVD files to audio; and besides, convert DVD to iPad, rip DVD to file to iPhone, convert DVD to Nokia video type, convert DVD to BlackBerry video formats and convert DVD to Android devices are also available for us.